Bass Fly Rig, Bass Multi-Effect from Tech 21. Tech 21 has unveiled the Bass Fly Rig, a bass-oriented version of their Fly Rig multieffect processor. 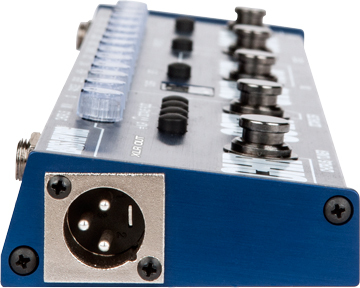 In addition to Tech 21's trademark SansAmp, this device includes an octaver, a compressor, a boost, a chorus and a tuner, with each section equipped with its own switch and several dedicated controls. 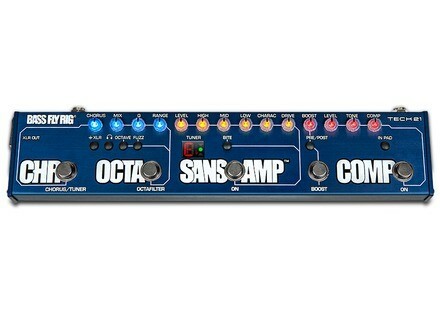 The SansAmp part features a 3-band EQ with drive, level and character settings, while the octaver includes an additional fuzz. The chorus is derived from Tech 21's Bass Boost Chorus pedal, the compressor is FET-based and the boost has a "pre/post" switch that allows to place it before or after the SansAmp, so as to decide whether to overdrive the signal (pre) or to boost the overall volume for "just" more punch (post). Utilizes included 9V, 200mA DC power supply. [NAMM] Orange OB1-300 Bass Combo After launching their analogue OB1 Series of bass amp heads at last year’s NAMM, Orange Amps now introduces the OB1-300 Combo. [NAMM] Orange announces O Bass Orange... Amps? 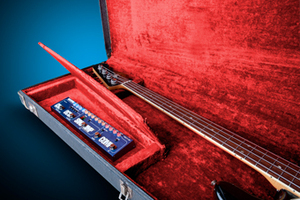 Not only now: Orange has presented the O Bass, a 4-string electric instrument available in three different finishes - not only orange. [NAMM] Orange debuts 4 Stroke bass amps Orange presents the 4 Stroke 300 & 500, two complete bass amp heads in a 2U rackmountable format.